Fall prevention isn’t something most of us need to worry about until later in life… Or is it? I used to think the same thing until I did a little bit more reading for fall prevention month. It turns out that we can actually do a lot to prepare ourselves for elderly life and reduce that fall risk that many carry into their later years. In my opinion, education is incredibly important when it comes to any situation we’re unfamiliar with. 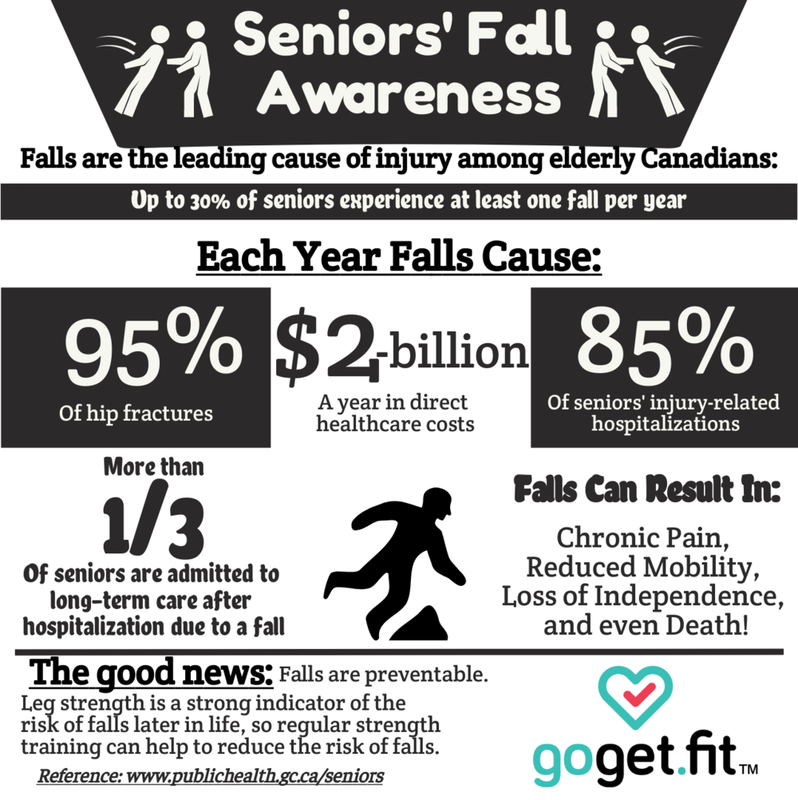 Falls are the number one cause of injury in elderly adults in Canada, and every year 1 in 3 Canadians will have at least one fall . Among seniors who fell last year, 61% were women, and 39% were men, and both their risk and instance of falls increased with age . But, a big point is that we don’t want to be afraid of falling, only to know the risks, as an exaggerated perception of fall risk actually led to a higher instance of falls . Therefore, we don’t want anyone to be afraid, only aware. Strength and aerobic exercise are a couple things that will both help your overall health now, as well as later in life. 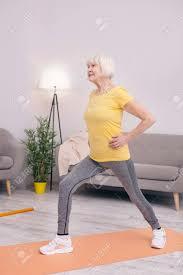 A recent study showed that strength and aerobic exercise that is established at a young age is easier for individuals to carry on to elder life, as opposed to when it isn’t established earlier in life . Along with this, you can also prepare yourself by watching out for the older members of your family. Educating yourself and them while helping to ensure that they have led their life with a mitigated fall risk. As we age there is quite a variability in the overall quality of life from person to person. Some individuals age quite well and maintain their strength, and independence. With others there seems to be an accelerated onset of weakness, disability, and frailty. Why is this? Well, in some cases it’s genetics, some are unlucky, while others have led lifestyles that have been non-beneficial, or even harmful to their own longevity. What are some things we can do to mitigate the risk of falls? Ask your doctor about referring you to an occupational therapist who can help you to brainstorm about different ways to mitigate your fall risk. Now, what about strengthening your body to decrease your risk of falling? Well, I actually found a list of great exercises to do at home that, if done regularly, can help to improve your strength, coordination, balance, and flexibility. Stand tall with your feet hip-width apart. 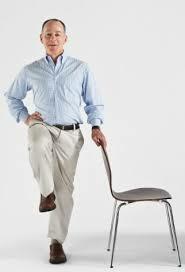 Place a sturdy chair to one side to hold for balance. 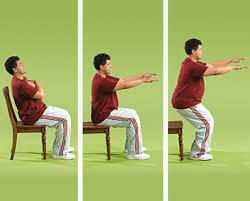 (As you gain strength, you can perform this exercise without holding onto a chair.) Keeping your back straight, step forward with one foot. Bend your front knee until your back knee is almost touching the ground. Make sure your front knee doesn’t extend past your front toes. Then, push through your front foot to return to standing. Repeat with the opposite leg. Start with five reps per leg before increasing to 10 reps per leg. Once 10 reps feel easy, add 5-pound weights. Begin seated in a sturdy chair. 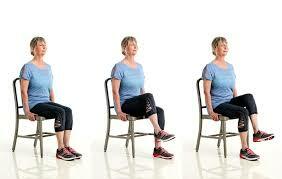 Then, holding on to the bottom of the chair with both hands, extend one leg straight out and bring your knee in toward your chest without moving your upper body to meet it. Extend your leg back out and lower your foot to the ground. Repeat with the opposite side. Start with five reps per leg, and work up to 10. Remember, everything above is helpful, but just because you do your best to prevent a fall there is still a risk. It’s important to check in with your healthcare and fitness professionals regularly, because as we age there are constantly changes going on in our bodies that we might not notice right away. If we’re vigilant and do the best to keep our bodies as healthy as possible, it’s surprising how much influence we can have on the effects of aging.